Sketched on my iPad whilst watching the documentary. Last week I found the time to watch all four hours of Ric Burns’: Andy Warhol a documentary film (it is in our library collection). It is divided into two parts – his earlier period and his later period. I watched the second part first. I don’t know why. I had recorded them from ABC TV ages ago and I guess I found them in that order. In NYC last year I saw Regarding Warhol, Sixty Artists, Fifty Years at The Met and enjoyed it, but now I wish I had seen this doco or read more about him beforehand. I had some awareness of the popular Warhol images, but not enough to fully appreciate his impact on art in the last century, nor how and why he went about it. He wasn’t one of my favourite American artists of the post-war period. I’m more of an abstract expressionist fan, so for me it is always a hunt for Clyfford Still, Mark Rothko, Lee Krasner, Franz Kline, Joan MItchell, Philip Guston, Pollock, de Kooning, etc. As for pop art, I guess I liked Jasper Johns, Robert Rauschenberg and Roy Lichtenstein more than Andy. I had not appreciated his background, nor the influence he had on modern art and pop culture; not fully. Maybe not at all really. I have always wondered whether the artistic work itself is more important than the influence of the artist, but as one curator says in the documentary, you could say the most influential artist of the first half of the C20th was Picasso and it was Warhol in the second half. The earlier part went into his childhood and his experience of art school. He was a good draftsman and could draw in his own fluid style really well, even though he did not think so. He seems to have had an enormous inferiority complex his whole life, but that is another story I guess. When he moved to NYC he first worked and became very successful as a commercial artist and illustrator for magazines. This is where he made a buck and financed his first explorations into the much poorer art world. In this period I think he produced some really beautiful images that they showed in the doco including his shoe illustrations, the “Progressive Piano” (1957) and the beautiful coloured birds in “Female Head” (also 1957). Despite this, he apparently he sold very little as an “artist” in several of his unsuccessful small shows. As I think the collector and gallery manager/owner Irving Blum said: Americans bought big cars and boats but they did not buy art in the 50s and 60s. It is worth noting that the clever Blum purchased the Campbell’s Soup exhibition set (after its display in his California gallery) for $1,000. He sold it many years later to the MoMA for $15 million. As a successful commercial artist he tried to attract the attention of other successful artists like the writer Truman Capote (with an entire exhibition devoted to him) and both Johns and Rauschenberg, visual artists like Warhol, who snobbishly refused to have anything to do with him because of his profession and his flamboyant manner (both were apparently still entrenched in their closets). Perhaps this closeting of true self is why neither were as influential with others as Warhol was? This seemed to be at a stage when he was still exploring and developing his own pop art style, but before he started his more bohemian collaborations with a vast collection of “creative” misfits from both the upper and lower echelons of contemporary society but not, according to the documentary and those interviewed, like Billy Name and various writers and artists, with anyone from the middle class. With the Factory he created an artists’ collective, a space where people could be collaboratively creative and explore new forms of artistic expression. He dabbled in film (with people like Paul Morrissey), music (like the Velvet Underground), silk screen printing, magazines (Interview), sculpture and briefly even operated a dance club in Manhattan. He found artistic merit in mass produced images (like advertisements, printed photographs in newspapers or even Most Wanted posters) and made popular culture and popular celebrities (Brando, Taylor, Monroe, Presley, etc.) into iconic images through his own obsession with them and his unique form of mass produced and vibrantly coloured portraits. Warhol seems to have been fascinated by what others disregarded as ordinary and he was gifted enough to raise the ordinary into an art form, paving the way for others to follow in this vein, like Jeff Koons I suppose. Many curators said he was truly gifted with colour, which is a bit obvious I suppose when you think about it, but I also learned that he was a great and inventive technician too (e.g his blotted line technique and his screen prints). He dragged in potential collaborators off the street, like Jed Johnson (a one-time boyfriend and later designer to the stars). It seemed to be a very free-flowing period in which he went with the cultural flow and explored possibilities because he could. But he could not say no easily and that probably led to his shooting by the writer and crazy person Valerie Solanas. Various people who knew him were interviewed and some said he was easy to dislike and unpleasant, particularly in his later years. He is described as withdrawn and fearful of close contact and affected, but I think those who knew him best said he was magnetic and also a very complex person. As well as inspiring me to further our efforts with our cultural programs, all of this made me think. I think it made me think more about the value of artistic collaboration and about not knowing where that might lead or even what it might deliver. I was reminded of discussions I had last year with a few colleagues about the usefulness of useless knowledge, by Warhol’s inspiration from rather ordinary images. And I was again reminded of the dangers of the mindless nature of a one-eyed pursuit of efficiency: by anyone really, but certainly by a cultural institution, and even in a university, a library must recognise that it is a cultural institution. 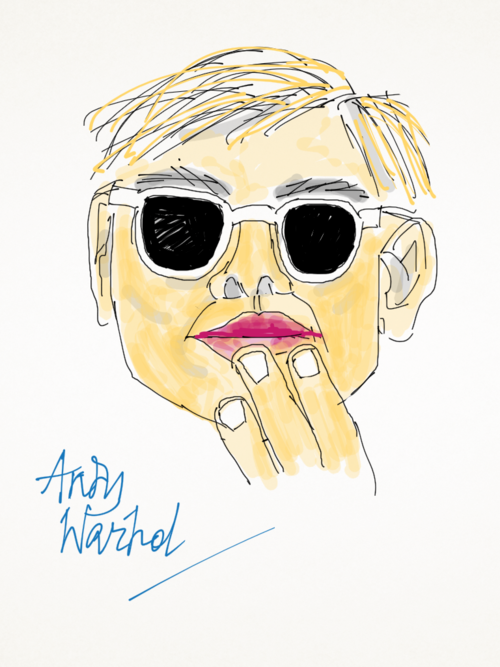 I think libraries have a lot more to learn from Warhol than they do from Jack Welch and sundry successful business theorists, but it is worth noting that Warhol himself always recognised that he also had a sharp business brain. That’s the bit that confuses me, but I guess it is also where the folk from our Design School come in because the art they produce seems grounded in all kinds of practical reality. Warhol seems to have started as a successful visual communicator in the 1950s and whilst he dabbled in so many other things a continuing thread in his artistic output seems to me at least to have been his gift for communicating through the visual image. I know that I’ll view the next Warhol exhibition that I see with different eyes. I’ve recently been asked by a few people about how I measured the effectiveness of our arts and cultural programs. I gave some rational answers that I don’t intend to go into here. In future I intend to say “by shoe size”.